In this exercise, you will create a diagram of swimlane same process. By doing this, you will organize the stages of work in lanes based on role to make responsibilities clear. SET UP Click the File tab, and then click New. Click Flowchart in the Suggested Searches list. Then follow the steps. 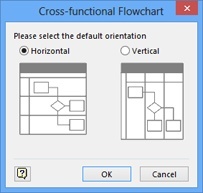 Double-click the Cross-functional Flowchart thumbnail. The orientation selection dialog box opens. Click OK to accept the Horizontal layout option. The CFF add-in places a title band and two swimlanes onto the drawing page. On the Cross-Functional Flowchart tab, in the Insert group, click the Swimlane button to add another lane to your diagram. 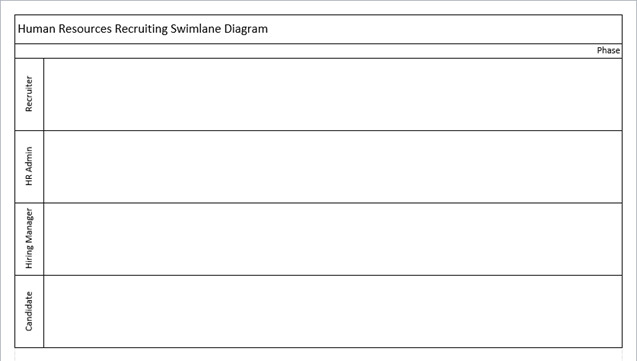 Click the Title bar and type Human Resources Recruiting Swimlane Diagram. Click the Function title bar for the top swimlane and type Recruiter. Type HR Admin as the title for the second swimlane, and Candidate for the third swimlane. The remaining screen shots for this exercise were captured using a black and white theme to improve legibility in the print edition of this book. Your swimlane diagram will continue to show the default theme colors, as seen in the preceding graphic, unless you have changed themes. 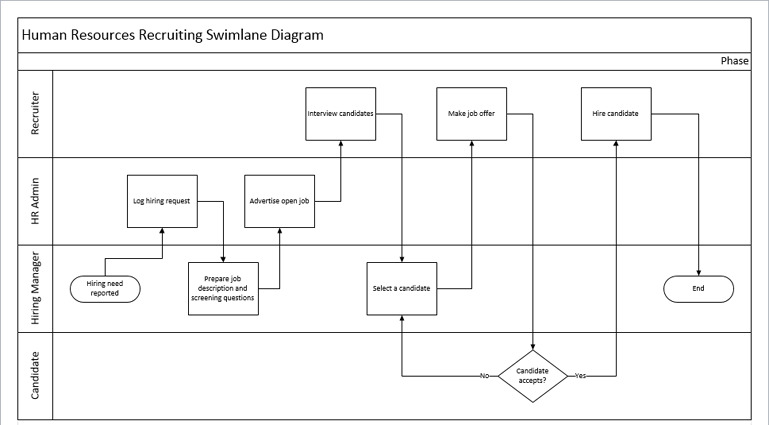 Drag a Swimlane from the Cross-Functional Flowchart stencil but before you drop it onto the page, pause briefly over the boundary between the HR Admin and Candidate swimlanes. An orange insertion bar appears indicating that the lane you drop will be inserted between the two existing lanes. SEE ALSO Visio 2013 swimlanes are built from a combination of containers and lists. Drop the swimlane onto the page, and while it is still selected, type Hiring Manager. On the Home tab, in the Tools group, click the Connector button. If you select a shape with the Connector Tool and then drag another shape onto the page, Visio automatically adds a connector from the first shape to the second. In this exercise, you accomplish this by leaving each shape selected after dragging it onto the page and typing text into it. You can stop the automatic addition of connectors by deselecting a shape before dragging the next one onto the page. Alternatively, you can select a different shape at any time to change which shapes will be connected automatically. Drag a Start/End shape from the Basic Flowchart Shapes stencil onto the drawing page, and use the Dynamic Grid to position it toward the left end of the Hiring Manager lane. With the Start/End shape still selected, type Hiring need reported. It is not necessary to exit text edit mode before continuing to the next step. 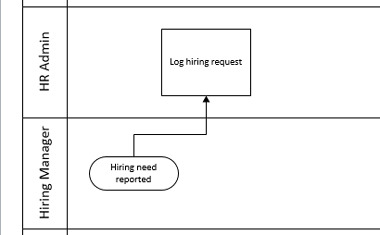 Drag a Process shape into the HR Admin lane, dropping it above and to the right of the Start/End shape, and then type Log hiring request. To fit the shapes for this exercise onto a single page, ensure that the left edge of each new shape you add to the page overlaps horizontally with the preceding shape as shown in the two graphics that follow. 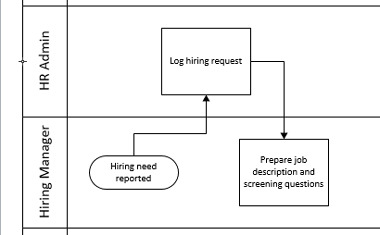 Draw a connector from the top of the Hiring need reported shape to the left side of the Log hiring request shape. Add a connector from the Candidate accepts? shape to the bottom of the Select a candidate shape, and then type No. Your swimlane diagram should look something like the following graphic. It’s unlikely that your drawing will look exactly like this one, because you probably made different decisions about placing shapes. However, after the general placement and connectivity are correct, you can adjust and tweak your diagram to make it look the way you’d like. CLEAN UP Save the drawing as HR Recruiting Swimlane, and then close it. One final note about the Visio 2013 take on cross-functional flowcharts: although the end result looks very much as it has in previous versions of Visio, the underlying structure is very different. In fact, structure is the operative word in the previous sentence. In Visio 2013, each swimlane is a container, and the overall framework is a list.